Spring has sprung. There are oh-so-many things to be happy about. But the arrival of fresh, green, spring produce is definitely one of them. And drinking a` Tropical Green Smoothie Paradise is DEFINITELY a fun way to celebrate their arrival. 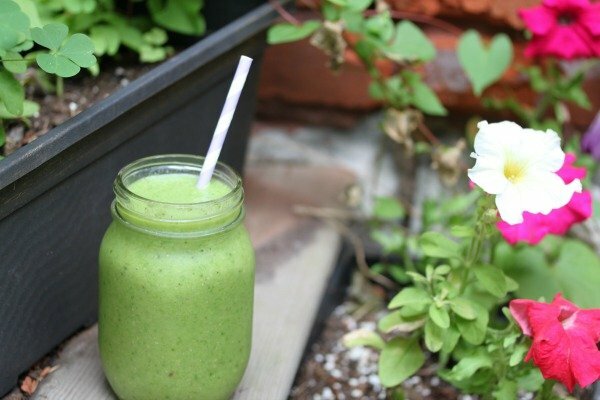 Green smoothies have been a fad now for close to a decade. And while they are becoming more common in cafes and home, there are still many people terrified at the idea of drinking something blended and GREEN. That’s where this delightful smoothie comes in. It may as well be called “Green Smoothie For Children”. It is so creamy and yummy and sweet-enough, you’d never know it was a green smoothie, if it weren’t for the colour. The spring green we are celebrating with this recipe is spinach. Though baby spinach is available year-round these days, there is something to be said for the first green leaves popping from the earth. A true sign spring is really, finally here. The tropical flavours in this Tropical Green Smoothie Paradise are what makes it so palatable and tasty. Tropical fruit is so naturally sweet, you can cure any refined sweet tooth with it. And try giving it to your kids, if you have any. Why not?! The only thing obvious in this smoothie is the colour. A perfect drink for beginner smoothie drinkers. If you have a small blender or one that isn't powerful, blend the spinach and liquid first. Then add the other ingredients and blend well. Otherwise, through in all the ingredients, start at a slower setting, and gradually increase speed as you blend all of the ingredients. If you aren't using frozen mango, add an ice cube or two. If you're feeling adventurous, substitute baby kale for the baby spinach. 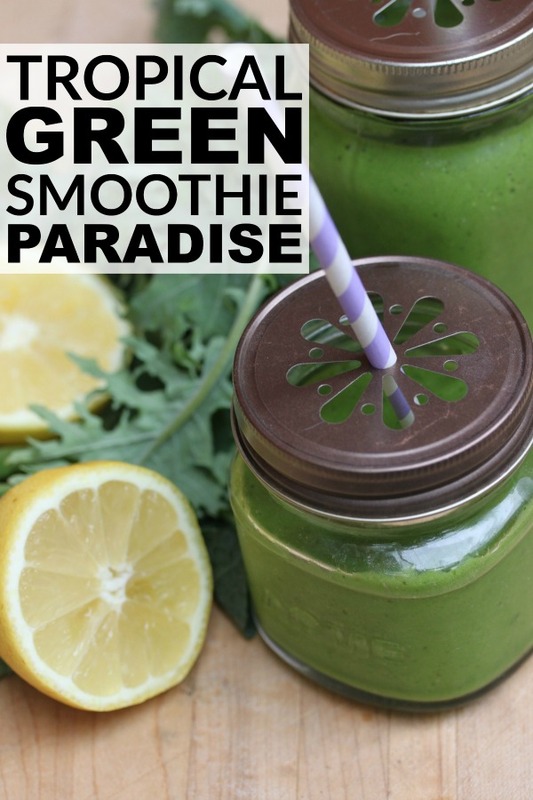 If you enjoyed this Tropical Green Smoothie Paradise recipe, please share it on Pinterest! And if you’re looking for more delicious and healthy recipes to add to your weekly menu, please follow our Food board where we share all kinds of delicious ideas! Sara Bradford is as passionate about her cocktails and duck fat as she is about green smoothies. And thinks real, whole, awesome food should taste delicious no matter what. A culinary nutritionist who takes (and leads) group cleanses by storm -- all the while knowing the most toxic ingredient is guilt. Her company’s work at Nourish ~ Real Food allows her to wade through the nutrition b.s. by providing hilarious wisdom and delicious recipes.